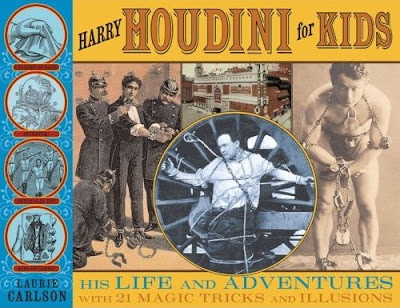 Harry Houdini For Kids: His Life and Adventures with 21 Magic Tricks and Illusions is now shipping from Amazon.com. The book is a combination biography and magic guide, teaching young readers how to stick a needle into a balloon without popping it, how to step through a note card, and how to make a coin vanish. Written by Western Oregon University professor Laurie Carlson, this entertaining biography also features a time line, curriculum links for educators, and books and websites for further exploration. 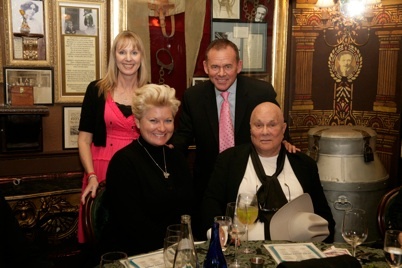 Houdini himself, Mr. Tony Curtis, was a very special guest at The Magic Castle in Hollywood this weekend, and being a AMA member, I had the great pleasure of attending the two-day event. Day 1 started with a sell out crowd packing the Palace of Mystery on Saturday night. On stage were reproduction Houdini props (two handcuff cases and a Milk Can) belonging to magician Jim Bentley, who helped host the event. At around 6:30, Mr. Curtis appeared -- literally! -- via a flash screen illusion set up on the stage. Good fun. I was relieved to see Mr. Curtis, sporting a white cowboy hat, bound from the illusion with such vigor. 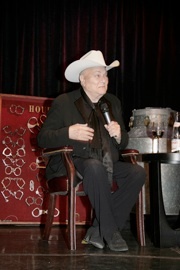 When I last saw him at the Hollywood Collectors Show in October 2007 he was confined to a wheelchair. I figured age had caught up to him. But Mr. Curtis explained that he had been recovering from pneumonia and had temporarily lost use of his legs. But his legs were better and tonight he was in top from, telling amazing stories about the making of Houdini (“Dunninger was a blowhard.”) as well as sharing candid stories about Marilyn Monroe, Walter Matthau, Frank Sinatra, Jack Lemon, Cary Grant, Jack Warner, and so on. His tales of old Hollywood were both hysterical and moving. It was also interesting to learn that Tony (who, like Houdini, is Hungarian) helped renovated a synagogue in Budapest. The interview, conducted by fellow AMA Life Member Joe Bauer, stretched well over an hour, and Tony happily took questions from the audience who delivered no less than two standing ovations. After the show, we all found our way down into the Inner Circle (aka the W.C. Fields Bar) where Mr. Curtis signed photos, posters, and copies of his autobiography, American Prince. He gladly posed for pics with fans, as the Castle relaxed their no photography policy for this event. Also on view were several pieces of artwork done by Mr. Curtis, including a few Houdini-themed pieces (see right). As the signing continued, I lingered in the Circle talking shop with the many notables who had come for the event, including the always friendly Mark and Sheila Cannon (Cannons Great Escapes) and handcuff expert Joe Fox. I was pleased to discover so many people had seen my article about the LIFE magazine photoshoot which revealed several cut scenes from Houdini. These pics proved to be a revelation to everyone! After the signing, Mr. Curtis and his company retired to the Houdini seance room for a private dinner and show. One wonders if he knew that the Milk Can in the seance room -- which is pointed out as being a “Houdini Milk Can” (it isn’t) -- is actually the Can he escaped from in a cut scene from Houdini. The normal Castle crowd was thinner on Sunday as we again gathered at the Palace of Mystery, this time for a screening of George Pal’s 1953 film Houdini. It was a blast to watch the movie with an audience. Every magic effect got a round of applause, as did the uncredited appearance of William Larsen Jr. (co-founder of the Magic Castle) doing a head chop routine during the scene at the magicians convention. I never knew that was Bill Larsen! He looked so different without his trademark white hair. 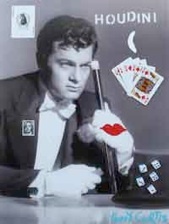 Houdini was the movie that got me interesting in magic, but I hadn’t watched it beginning to end in many years. It struck me what a fine film this is. Bright and breezy with beautiful stars, I never realized just how much magic features in the movie. The effects are staged start to finish without a camera edit. It also hit me just how tragic the ending is, and how the specter of death (in the form of Halloween) stalks the stars though-out the movie. It’s really a terrific example of a classic studio era film. And you gotta love that old school brighter-than-life Technicolor! After the movie, Mr. Curtis again appeared (but not via magic this time) for a Q&A with the audience. It was a more casual affair this time, even playful, with a lot of familiar faces back for this second day. 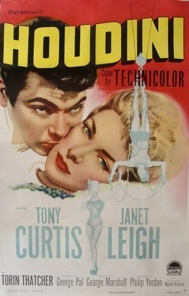 A standout moment was when Mr. Curtis mentioned, with great affection, his co-star and ex-wife Janet Leigh “who’s gone now.” It was also interesting when the woman sitting beside me revealed that she had watched Mr. Curtis film a scene for Houdini when she visited the set as part of a USO tour. After the Q&A, we again traveled down into the Inner Circle where Tony singed books and photos, including a still from his animated appearance on The Flintstones as “Stoney Curtis.” He also posed for many photos with the official Castle photographer, so I’m expecting we’ll see a gallery on the official Magic Castle website soon. As I left The Castle and stood waiting for my car, I was lucky to catch one last glimpse of Tony and his family getting into their own car parked outside the service entrance. All in all, it was a wonderful weekend of magical memories for all who attended.